Join our CSA & Save! Community Supported Agriculture (CSA) fosters a mutually beneficial relationship between farmers and families. When community members sign up for a CSA they are helping the farmer earn important early season capital. In return, CSA members benefit from overall lower food costs, farm fresh products and greater farm access. Most CSAs require an annual or semi-annual commitment and offer several payment options. Farm products are then dropped off or picked up on a weekly basis for the duration of the growing season. Our CSA is a great way to enjoy our full line of products that include pasture raised chicken, whey fed pork, and 100% grass fed beef all year while saving up to 12% off our retail price! You chose the product you want when you want it! No need to wait until a certain day of the week or get stuck with cuts of meat you might not want. We also make deliveries to Woodstock, VT during the year. Pay at the time of sign up the dollar amount that works for you (minimum $250) and start saving immediately on all SpringMore Farm products. The more you put down the larger your discount! 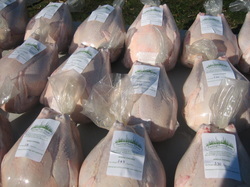 Discount is applied to any and all of SpringMore Farm meat products (chicken, pork, and beef). Discount is from the retail price of the product and can not be used on packages or already discounted products. ​Can be used for one purchase or multiple purchases through out the year. You can sign up by downloading the sign up sheet below and mailing it to us (snail mail or e-mail) or stop by the farm and sign up!